Afterwards, Aaron, Ryan and I set up a streaming stress test with a number of laptops. Even with 3 or 4 devices connected near the access point, the stream was surprisingly usable. Delay was minimal, but did freeze for fractions of a second every now and then. 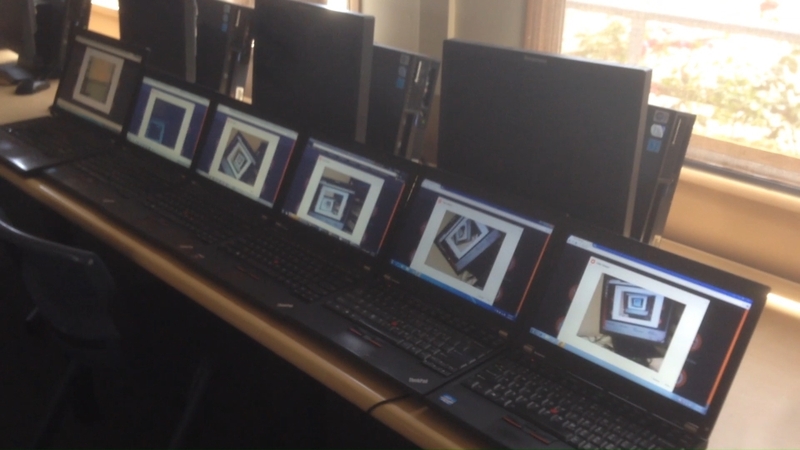 Once all 6 laptops were connected and moved to the next room, the stream suffered more. It’s important to note that the walls separating the access point from the laptops are shielded and would negatively impact stream quality. Real world scenarios should never approach the outcome of this simulation. After all, only one client needs to be connected to the S.A.R.T at any one time, and that client will be directly connected to the Xirrus access point. Before we concluded the test, I checked the RAM and CPU usage of the NUC. RAM was a stable 1.6 out of 4GB and CPU utilisation hovered around 60%. It’s pretty clear that the connection is the limiting factor or bottleneck here. Eventually we will start experimenting with some CAT6 ethernet cables and different WiFi cards, chips and dongles on the NUC to see if we can squeeze out any more performance. Overall, this test provided us with some valuable data on possible causes of laggy or delayed streaming, and we’ll be able to invest time to rectify these issues in the near future.